Instructors are encouraged to use digital materials as much as possible and limit their reliance on printed materials. With your faculty card, you can photocopy and print for free on the Sciences Po photocopiers in every building on the Paris campus. There is a photocopier reserved for faculty next to the Faculty Lounge at 28 Rue des Saints-Pères in Paris. Find out more about using the copy machines. To use the photocopiers, simply activate your faculty card once and for all at an authentication terminal at 28 Rue des Saints Pères, in the Faculty Lounge, on the ground floor of the library at 27 Rue Saint-Guillaume, or on the third floor of the library at 30 Rue Saint-Guillaume. your card is activated once the message “Votre carte a bien été enregistrée” appears. If this message does not appear, the system will send you back to the homepage. You will need to start the procedure again or ask for help at reception. On the regional campuses, photocopiers are available near the faculty lounges. A scanner is available in the Faculty Lounge at 28 Rue des Saints-Pères in Paris. The photocopier near the lounge can also scan documents. On the regional campuses, scanners are available near the faculty lounges. The documents and/or files to be copied must be given directly to your programme secretary at least one week before the session you need them for. The files you submit will be saved in PDF format. 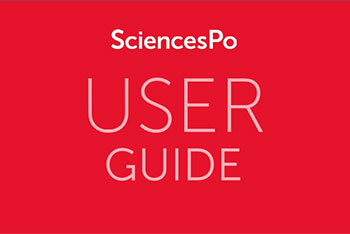 Course packs made available for purchase (over 30 pages) will have a cover page with the Sciences Po logo. The bibliographical references of the original documents will systematically be indicated (name of the work, author and publisher). Course materials for Undergraduate College courses are not photocopied; students view them online on your workspaces. Course packs of up to 15 sheets printed recto/verso (30 pages) in black & white are distributed free to students. They are either delivered to the classroom for the scheduled session or made available to you at the programme secretary’s office. Course packs of more than 30 pages are printed and put on sale at the Bookshop (fr.). A copy is prepared for you free of charge. The secretary will notify your students by email when the material goes on sale. They need to show their student ID card to buy a copy. To find out how to have materials copied, inquire at the campus secretary’s office. The Act of 3 January 1995 entitles the Centre Français d’exploitation du droit de copie (CFC) to manage photocopying rights for books and the press. The Fondation Nationale des Sciences Politiques is under contract with the CFC to help protect intellectual property. This contract makes all reproductions of protected works lawful. An “inventory of works” form is emailed to you at the start of the semester. This is where you declare the protected publications to be photocopied and distributed for your course. the bibliographical references of the extracts you photocopy must appear on the copies.